Learn all about Cerave skin renewing cream serum, reviews, ingredients and cost. Cerave Skin Renewing Cream Serum, developed with dermatologists, is designed to give you the best of both worlds by helping diminish the appearance of fine lines and wrinkles while also helping repair the protective skin barrier. This unique, comforting formula helps restore brighter, smoother skin that looks healthy and radiant. Benefits: Non-greasy and fast absorbing formula. Cerave encapsulated retinol complex helps reduce the appearance of fine lines and wrinkles without being harsh on skin. Three essential ceramides help restore the protective skin barrier. Hyaluronic acid attracts needed moisture to skin to hydrate. It is gentle, non-irritating, non-comedogenic and fragrance-free. A vitamin A molecule that helps create better, healthier skin cells by telling old or damaged cells to function normally. Cerave Encapsulated Retinol Complex: Unlike many retinols, which can be harsh and irritating to skin, this innovative complex contains encapsulated retinol, a unique delivery system which stabilizes and delivers the retinol throughout the skin gradually over time, so it helps minimize irritation. It helps reveal radiant, brighter skin, reducing the appearance of fine lines and wrinkles. Cerave Skin Renewing Cream Serum contains an encapsulated 1% retinol and ceramide complex, due to which it won’t cause harsh irritation like many retinols. The non-greasy and fast-absorbing formula also contains vederine, a vitamin D analog known to provide epidermal and skin barrier support. Ceramide EOS has the research that Ceramide 1 and 3 will help reduce the irritation water loss caused by sodium lauryl sulfate. The border between serums and lotions/creams is rather undefined, which the consistency and name of Cerave Skin Renewing Cream Serum is an example of. People who does not have particularly dry skin will probably find this serum rich enough to also cover the Moisturize step of a COMP routine. Cerave Skin Renewing Cream Serum is the cheapest serum in this review, but nonetheless contains some good antioxidants and skin-repairing ingredients besides retinol. It claims to have a 1% complex of retinol and ceramides, but emphasis is probably on the latter as the price is simply too low for the serum to contain that much retinol (it is expensive to stabilize retinol in higher concentrations). Cerave Skin Renewing Cream Serum is a great affordable serum with a low to moderate concentration of retinol, but if you are looking for something more potent you will have to spend more. 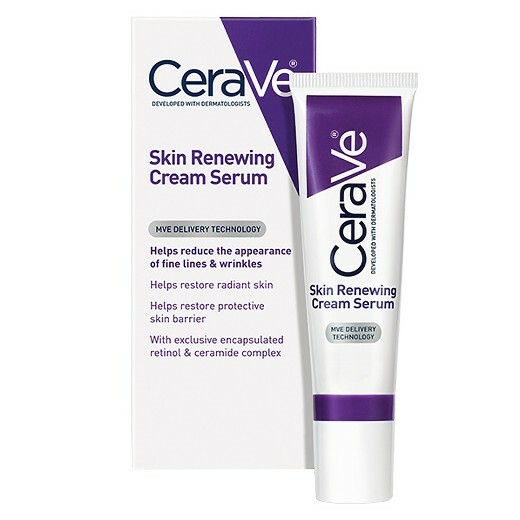 How to use Cerave skin renewing cream serum? Apply in small dots where needed around the face and gently smooth until thoroughly absorbed. Use it alone or under makeup once or twice a day. It is for external use only. When using this product avoid getting into eyes. If contact occurs, rinse thoroughly with water. If skin irritation occurs, wash product off and consult a physician. When first applying this product, you may experience a slight tingling sensation. This is an indication that the product is working. If the sensation is prolonged or becomes unpleasant, discontinue use and consult a physician. Skin would either get extremely dry or ridiculously oily. Cerave serum is the only product that smoothed my skin, got rid of acne and scars/marks and makes skin less oily, all the while moisturizing. It can be used during any weather and acts as a skin protectant as well as a moisturizer/acne treatment. In combination with Basis soap for sensitive skin my face has transformed. One says,” I absolutely love Cerave skin renewing cream Serum with delivery technology. It is developed by dermatologists and it helps reduce the appearance of fine lines and wrinkles, restore radiant skin, restore protective Skin Barrier and it includes encapsulated retinol and ceramide complex. I have very sensitive skin and this product does not irritate it and one bit. I use this nightly before going to bed with couple drops of tea tree oil and it leaves my skin acne-free smooth hydrated revitalized and ready for the next day”. Cerave Skin Renewing Cream Serum cost is $16.9. It is a new cream serum formulated to reduce fine lines and wrinkles while repairing the skin’s barrier to reveal brighter, smoother skin with a formula that contains 1% retinol and a ceramide complex.